Thanks to Sean of Sean Munger.com for this recommendation. My Take on it – This is far from the kind of film that I usually enjoy. It moves really slowly and tries to give us a picture of the life of celebrities who long for their glory days and hope upon hope that those days are once again right around the corner. 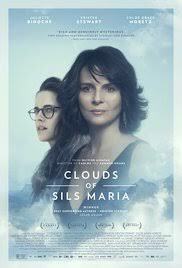 The cast is pretty good here and Juliette Binoche and Kirsten Stewart have some great scenes together but I found the overall storyline to be a bit over bearing for me. The storyline doesn’t move along at a good pace and I was hoping it would end much sooner than it eventually did. I found it extremely hard to find some kind of connection to the characters or their situations which made me lose any interest pretty early on. The idea of the premise tho is a sound one because it’s interesting to see what people think of their own life’s work and how they reflect on it years later once again longing for those glory days to return. Unfortunately, I just couldn’t connect with the way it was presented. Bottom Line – The story here is a bit too heavy for me to enjoy. Binoche and Stewart are both fine here as the actress and her assistant. The story moves along way too slowly for me and it seems as if they are trying to give us a glimpse into the life of celebrities and how they are affected by the way their lives have been lived during the course of their career. I wanted this film to end earlier because I just couldn’t find any way to connect with the characters or their situations. This movie isn’t for everyone, but I thought it was the best film of 2015. Cheers! I felt like there was a lot going on in this film but because nothing is developed particularly well it also felt a bit like there was actually nothing going on.